I saw so many people in workshops and conferences running around in really cute classwear. Some were in short belly bare cropped tops, some tube tops, others in spaghetti strap camisoles and a myriad of bottoms including boy shorts or capris plus a coined or fringed hipscarf. When it was time for lunch or just some casual strolling between classes, these attendees were covering up in big sweatshirts or clunky jackets as there doesn’t seem to be a thin, covering to wear atop a nice classwear set. 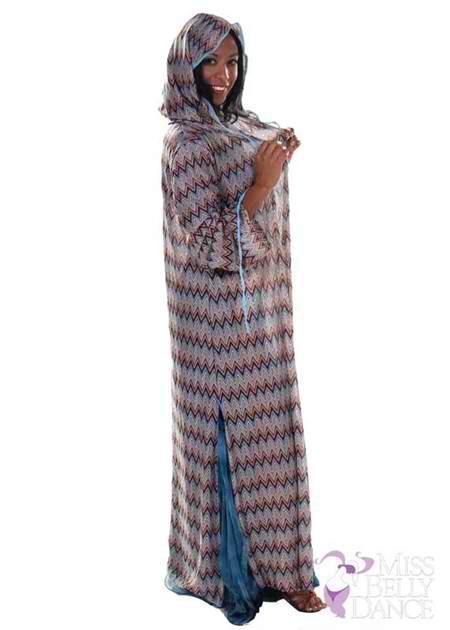 I kept thinking, wouldn’t a beautiful jilbab or something similar be much more elegant for covering their unique workout wear? So, we thought of this. The Chebba Hoodie, The Pera Hoodie and the Urban Shimmer series. Pera Hoodie – This garment is long and meets the ankles. It’s made of a durable patterned fabric and closes with a string tie. Though fairly sheer you can see that it does the job of masking one’s classwear fairly well. It’s also used for regular fashion and to preserve one’s modesty. It’s lightweight and can be folded neatly into most carryalls for travel. We hope you’ll find it as useful as we have. Get a few as gifts for your friends, makes a great item for birthdays and special milestones.